qPCR arrays are the most reliable tools for parallel quantitative analysis of gene expression signatures of a focused panel of genes. They are available for mRNAs and microRNAs expression profiling in 96-well, 384-well and (hopefully soon) in 1536-well formats. The detection chemistry used in qPCR arrays is either SYBR Green I (or comparable DNA binding dyes) or optimized probe-based primer sets (mainly TaqMan probes or LNA probes). They can screen the entire panel of expressed microRNA or sub-panels, e.g. pathway- or disease-focused gene families. qPCR arrays can also be customized to contain a panel of genes tailored to your specific research interests. Pathway Focused - Profile the expression of a panel of selected genes relevant to a pathway or disease state. Simple and Accurate - Simple real-time PCR method provides the advantages of qRT-PCR = high sensitivity and wider dynamic quantification range. Quantitative - If applied properly the are fully quantitative and exhibit a good reproducibility. Designed for high troughput applications and routine use - Brings expression profiling to almost any lab with a block based real-time PCR instrument. Sensitivity - With the sensitivity down to 1 ng per reaction setup or 5 µg of total RNA per entire array plate provides greater than 80 percent present call rates (stated by the producer). Reproducibility - The high reproducibility of the system, with replicate correlation coefficients r > 0.99, means that experimental samples can be reliably compared across array plates and within multiple runs. Specificity - The specificity of the system, imparted by the combination of SYBR Green primers or Probe mixes and PCR master mixes, guarantees a single product of the predicted size from every reaction without secondary products such as primer dimers. The PCR Arrays are available in both 96-well, 384-well and 1536-well plates and are used to monitor the expression of 84 up to over 1000 genes related to a disease state or pathway plus multiple reference genes. Multiple controls are also included on each array for genomic DNA contamination, RNA quality, and general PCR performance. Data analysis can be done in a simple version on the basis of Excel-based data analysis template, or by the GPR method (see below) or using high complex analysis software tools like Genex (MultiD, Sweden). Data analysis is mainly based on the ΔΔCt method (Livak & Schmittgen, 2001) with normalization of the raw data to either housekeeping genes or an external RNA control. The workhorse of modern molecular biologyis charging forward using both conventional and digital methods to explore single cells and even single molecules. Reproducibility of quantitative RT-PCR array in miRNA expression profiling and comparison with microarray analysis. Chen Y, Gelfond JA, McManus LM, Shireman PK. BMC Genomics. 2009 Aug 28;10: 407. BACKGROUND: MicroRNAs (miRNAs) have critical functions in various biological processes. MiRNA profiling is an important tool for the dentification of differentially expressed miRNAs in normal cellular and disease processes. A technical challenge remains for high-throughput miRNA expression analysis as the number of miRNAs continues to increase with in silico prediction and experimental verification. Our study critically evaluated the performance of a novel miRNA expression profiling approach, quantitative RT-PCR array (qPCR-array), compared to miRNA detection with oligonucleotide microchip (microarray). RESULTS: High reproducibility with qPCR-array was demonstrated by comparing replicate results from the same RNA sample. Pre-amplification of the miRNA cDNA improved sensitivity of the qPCR-array and increased the number of detectable miRNAs. Furthermore, the relative expression levels of miRNAs were maintained after pre-amplification. When the performance of qPCR-array and microarrays were compared using different aliquots of the same RNA, a low correlation between the two methods (r=-0.443) indicated considerable variability between the two assay platforms. Higher variation between replicates was observed in miRNAs with low expression in both assays. Finally, a higher false positive rate of differential miRNA expression was observed using the microarray compared to the qPCR-array. CONCLUSION: Our studies demonstrated high reproducibility of TaqMan qPCR-array. Comparison between different reverse transcription reactions and qPCR-arrays performed on different days indicated that reverse transcription reactions did not introduce significant variation in the results. The use of cDNA pre-amplification increased the sensitivity of miRNA detection. Although there was variability associated with pre-amplification in low abundance miRNAs, the latter did not involve any systemic bias in the estimation of miRNA expression. Comparison between microarray and qPCR-array indicated superior sensitivity and specificity of qPCR-array. Description of the molecular phenotypes of pathobiological processes in vivo is a pressing need in genomic biology.We have implemented a high-throughput real-time PCR strategy to establish quantitative expression profiles of a customized set of target genes.It enables rapid, reproducible data acquisition from limited quantities of RNA, permitting serial sampling of mouse blood during disease progression.We developed an easy to use statistical algorithm—Global Pattern Recognition—to readily identify genes whose expression has changed significantly from healthy baseline profiles.This approach provides unique molecular signatures for rheumatoid arthritis, systemic lupus erythematosus, and graft versus host disease, and can also be applied to defining the molecular phenotype of a variety of other normal and pathological processes. This paper tried to determine why a drug (a-GalCer or a-galactosylceramide) could inhibit the onset of autoimmune diabetes. Among many experiments, GPR was used to determine why a systemic drug (a-GalCer) treatment elicited the migration of mature Dendritic Cells (DC) and T cells into the Pancreatic Lymph Nodes (PLNs), but not the Mesenteric Lymph Nodes (MLNs) of Non-Obese Diabetic (NOD) mice. They compared the expression levels by real-time PCR of genes encoding 19 different chemokines and 11 of their receptors in the PLNs and MLNs of NOD mice that were either untreated or injected 24 h previously with a-GalCer. There were no significant differences between PLNs and MLNs from untreated mice. However, CCL17 (5.3-fold), CCL19 (2.4-fold), CCL5 (1.8-fold), and CXCL16 (1.6-fold) gene expression levels were significantly higher in the PLNs than MLNs of a-GalCer-treated NOD mice. Conversely, CCR4 (3.3-fold) and CCR6 (1.7-fold) were expressed at higher levels in the MLNs of the a-GalCer-treated NOD mice. This differential level of chemokine expression may underlie the migration of DCs and T cells to the PLNs, but not the MLNs, of a-GalCer-treated NOD mice thus resulting in an inhibition of autoimmune diabetes. A robust, rapid and flexible real-time PCR assay for hierarchical genetic typing of clinical and environmental isolates of Francisella is presented. Typing markers were found by multiple genome and gene comparisons, from which 23 canonical single nucleotide polymorphisms (canSNPs) and 11 canonical insertion-deletion mutations (canINDELs) were selected to provide phylogenetic guidelines for classification from genus to isolate level. The specificity of the developed assay, which uses 68 wells of a 96-well real-time PCR format with a detection limit of 100 pg DNA, was assessed using 62 Francisella isolates of diverse genetic and geographical origins. It was then successfully used for typing 14 F. tularensis subsp. holarctica isolates obtained from tularemia patients in Sweden in 2008 and five more genetically diverse Francisella isolates of global origins. When applied to human ulcer specimens for direct pathogen detection the results were incomplete due to scarcity of DNA, but sufficient markers were identified to detect fine-resolution differences among F. tularensis subsp. holarctica isolates causing infection in the patients. In contrast to other real-time PCR assays for Francisella, which are typically designed for specific detection of a species, subspecies, or strain, this type of assay can be easily tailored to provide appropriate phylogenetic and/or geographical resolution to meet the objectives of the analysis. Used an early version of the StellARray to confirm CGH (Comparative Genome Hybridization) results in a mouse model to cancer however they did not publish their use of GPR but instead used classical statistical measures.Nonhomologous end joining (NHEJ) is a critical DNA repair pathway, with proposed tumor suppression functions in many tissues. Mutations in the NHEJ factor ARTEMIS cause radiation-sensitive severe combined immunodeficiency in humans and may increase susceptibility to lymphoma in some settings. We now report that deficiency for Artemis (encoded by Dclre1c/Art in mouse) accelerates tumorigenesis in several tissues in a Trp53 heterozygous setting, revealing tumor suppression roles for NHEJ in lymphoid and non-lymphoid cells. We also show that B-lineage lymphomas in these mice undergo loss of Trp53 heterozygosity by allele replacement, but arise by mechanisms distinct from those in Art Trp53 double null mice. These findings demonstrate a general tumor suppression function for NHEJ, and reveal that interplay between NHEJ and Trp53 loss of heterozygosity influences the sequence of multi-hit oncogenesis. We present a model where p53 status at the time of tumor initiation is a key determinant of subsequent oncogenic mechanisms. Because Art deficient mice represent a model for radiation-sensitive severe combined immunodeficiency, our findings suggest that these patients may be at risk for both lymphoid and non-lymphoid cancers. Bar Harbor BioTechnology, Inc. and Marjorie Smithhisler, Lonza Walkersville, Inc. In this paper, we present three application ex-amples demonstrating the utility of the StellARray Gene Expression System to reveal gene expression level changes in diverse biological contexts such as toxicology, cancer, and stem cell differentiation. By combining Clonetics and Poietics Primary Human Cells with the StellARray Gene Expression System, all from Lonza, the researcher is pro-vided with a synergistic system to reveal gross and subtle changes in gene expression when analyzing in vitro models of human tissues. This is accomplished easily in 96- and 384-well formatted StellARrayqPCR Arrays using a stan-dard qPCR instrument and a generic SYBR® Green-based Reagent Master Mix. The Global Pattern Recognition (GPR) Data Analysis Tool is optimally suited to generate a ranked list of significantly changed genes within a qPCR dataset. GPR overcomes the inconsistencies associated with con-ventional single gene normalization procedures by eliminat-ing a priori normalizer selection. Overall, the results show how the StellARray Gene Expression System eliminates false positives and provides TRUE results that are backed by a rigorous statistical analysis. Bar Harbor Biotechnology has solved one of the most fundamental problems facing experimentation using Real-Time PCR. How do I analyze the data and determine REAL changes in gene expression? The answer to this question is found in Bar Harbor Biotechnology, Inc.'s patent pending Global Pattern Recognition (GPR) algorithm, which makes gene expression analysis simple, fast and reliable. Here are some reasons why we developed this algorithm. The traditional approach to measure gene expression changes from Real-Time PCR data has been to normalize the results of a gene of interest with respect to a housekeeping gene (aka. a reference or normalizer gene). The general assumption is that the level of expression of the normalizer gene does not change in the context of the experiment and can be used to normalize the variability in RNA quantity between individual samples. By normalizing to a housekeeping gene, in theory, a magnitude of change can be calculated between groups of samples for a gene of interest. However, this mode of analysis is greatly complicated by the fact that housekeeping genes commonly used as normalizers (e.g., GAPDH, β-actin, and HPRT) themselves can change in apparent expression when comparing tissues or cells in different states (Bustin 2000; Schmittgen et al. 2000; Goidin et al. 2001; Hamalainen et al. 2001). 18S rRNA is another normalizer that intuitively and experimentally seems more stable, but even 18S can vary in comparison to other genes when analyzed by sensitive Real-Time PCR techniques (Bustin 2000, Akilesh et al., 2003). Any small variation in the normalizer amplification would therefore compromise the analysis of the complete Real-Time PCR data set. When a single gene normalizer is selected, gene expression changes are typically ranked by their magnitude of change using the ΔΔCt method, with those genes showing the largest fold changes ranked as most significant. Unfortunately, these large changes in gene expression may mask small, but biologically important changes in gene expression, such as master regulator genes (e.g., transcription factors). In biology, however, larger is not always synonymous with importance. To combat the above mentioned problems, Bar Harbor Biotechnology, Inc. developed a modified Global Pattern Recognition™ algorithm (Akilesh et al., 2003), which is optimally suited to generate a ranked list of significantly changed genes within a Real-Time PCR dataset. This unique algorithm and accompanying software overcomes the problem of identifying invariant normalizers and the pitfalls of producing faulty statistics based merely on magnitude of change. Global Pattern Recognition provides a true statistical analysis of results based on consistency in the data, which makes Global Pattern Recognition™ optimally suited to detect small, but reproducible changes. Only after the genes are statistically ranked is the magnitude of the change calculated. A typical experiment would utilize 'biological replicates' (Bio-Reps). Bio-Reps are defined as samples collected from separate and closely matched biological samples. They are processed individually under closely matched conditions. Advisedly, it is best to analyze at least 3 bio-reps in each of two groups, representing for example '3 sick vs. 3 healthy' or '3 treated vs. 3 untreated' groups (but Global Pattern Recognition can handle much larger data sets). Global Pattern Recognition processes the data derived from groups of Bio-Reps and reveals the 'constellation' of changing genes. Each constellation can be evaluated for the most likely biological context providing the researcher with a better understanding of the overall results. Just as early sea navigators used the stars to triangulate their position on the ocean, Global Pattern Recognition globally positions the expression level of each gene with respect to all genes within an experiment. This can be done without prior assumption that a gene (normalizer) has an invariant expression level. Global Pattern Recognition is unbiased in that it enables the experimental data to define the invariant normalizer genes, not the experimenter. The use of any gene as a potential normalizer also maximizes the use of the limited real-estate on a StellARray™ plate by eliminating the loss of wells used to contain potentially erroneously predefined normalizers. Global Pattern Recognition is extremely simple to use and reliably tabulates statistical significance (p-value) of gene expression changes on the fly allowing you to immediately focus on the real biology. Simply log into GPR, select the StellARray that you ran on your Real-Time PCR instrument, upload your data and submit for analysis. An HTML or Excel® formatted file will be generated that gives a ranked list of genes by p-value, fold change value, and links to MGI and NCBI gene pages. 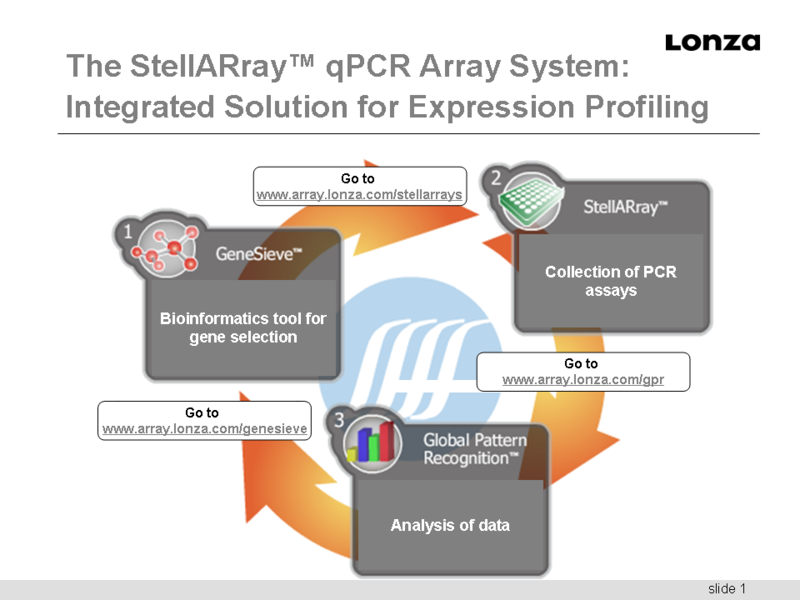 With each purchase of a StellARray™ pack your account will be receive analysis query credits sufficient to analyze each plate. This is a review which contains within it a subtle mention of GPR as the inferred solution to the problems of a priori choosing of normalize genes and in particular the it refers to problems with the software called GeNorm…..
SABiosciences leads the field in high-performance SYBR Green real-time PCR analysis. Our RT² Profiler PCR Arrays (patent pending) analyze expression of a panel of genes associated with any one of over 100 biological pathways or specific disease states. The RT² qPCR primer Assays are experimentally tested and validated qRT-PCR primer sets for every human, mouse, rat, rhesus macaque, or even fruit fly gene. These qPCR primer assays are ready-to-use for gene-by-gene expression analysis, microarray data validation, biomarker discovery and siRNA knock-down verification. In combination with our special formulated and instrument-specific PCR master mixes, our complete RT² qPCR products provide the accurate, reliable, and convenient SYBR Green analysis needed by today's research. Trust the experts in SYBR Green real-time PCR detection. Seminar - How qPCR arrays works? available for human, mouse and rat. Maximize efficiency - Select assays for your targets of choice out of gene lists of functionally related gene families or biological pathways. Order them as single assays or configure your own custom panel on a LightCycler® 480 Multiwell Plate. Ensure optimal results - Rely on function tested qPCR assays based on proven Universal ProbeLibrary technology, with detailed bioinformatic background information and novel error-detection features. Get the complete picture - Discover the full functionality of your targets in complex biological pathways, and reveal their influence on processes leading to diseases or disorders. The series of 6 easy Video Tutorials will teach you how to use the RealTime ready Configurator. Learn how to search assays for your target an how to configure your custom panel. Go directly to the free online configuration and shopping tool to search and order single assays or configure your own custom panels with assays of your choice. Each assay is function tested in qPCR on the LightCycler 480 Instrument using an universal biological sample (total RNA transcribed in two-step reaction) under standard PCR conditions. Total reaction volume is 20 µl in 96-well plates and 10 µl in 384-well plates, using the LightCycler 480 Probes Master. Featuring validated and Tm-normalized LNAbased capture probes, the miRCURY LNAarrays offer global microRNA expression profiling with unmatched specificity and sensitivity. This animation describes Exiqon's LNA technology, and why it is superior to DNA in the study of microRNAs, which are challenging for many reasons. Their short length and the high sequence similarity between closely related microRNAs makes it hard to detect them with sufficient specificity and sensitivity. Open platform - protocols available for Tecan and MAUI hybridization stations, and for manual hybridization. 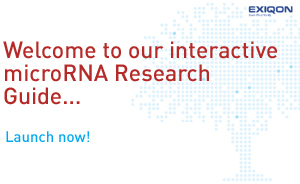 Our new interactive tutorial will walk you through every step of a microRNA experiment; from RNA Isolation to Functional Analysis. If your research application requires special manufacturing modifications - such as a different dye or assay volume, or you would like to have your assays plated in a specific way, our custom services can help. TaqMan® Gene Expression Assays provide over 1.3 million predesigned primer/probe sets covering 23 species, the most comprehensive set of quantitative gene expression assays available. Alternatively, custom assays enable you to study the expression of any gene or splice variant in any organism. Innovative TaqMan® Assays for microRNA and other small RNAs, as well as longer noncoding RNA transcripts such as pri-miRNAs and long noncoding RNA. We offer products for noncoding RNA discovery, profiling, quantitation, validation, and functional analysis. The precision of TaqMan® probe-based chemistry makes SNP genotyping and copy number variation studies more accurate than ever. Choose from 4.5 million human and mouse TaqMan® SNP Genotyping Assays or design your own Custom TaqMan® SNP Genotyping Assays. For analysis of SNPs in genes for drug metabolizing enzymes (DMEs), we offer 2,700 unique TaqMan® DME Assays that detect polymorphisms in 221 genes for DMEs and associated transporter targets. For copy number variation studies, we offer over 1.6 million predesigned TaqMan® Copy Number Assays with human, genome-wide coverage, and mouse and marker/reporter assays. Custom and Custom Plus TaqMan® Copy Number Assay options are ideal when a predesigned assay for a target is not available. Competitive Allele-Specific TaqMan® PCR (castPCR™) technology detects and quantitates rare sequences in a background of common sequence by specifically blocking amplification of all but the rare-sequence variants. It has great potential for detection of rare mutations such as in circulating cancer cells. Revolutionary TaqMan® Protein Assays enable fast, easy identification, and relative quantification of protein markers from limited quantities of cultured cells. Choose from predesigned assays for human stem cell pluripotency markers and control proteins, or create your own assay from your biotinylated antibodies. The WaferGen SmartChip System enables profiling and validation workflows on a single platform, by combining high-throughput, cost-effective target discovery with the sensitivity, precision, and dynamic range of real-time PCR for validation studies. Gene expression profiling of specific diseases has become increasingly important in drug development. Comparison of gene expression patterns between normal and diseased patients or expression profiles in the presence or absence of drugs leads to discovery of genes or a set of genes that can be used in drug development. This requires monitoring of tens, hundreds or thousands of mRNAs in large numbers. The WaferGen SmartChip System offers the capability to achieve this level of throughput with a high degree of accuracy. MicroRNAs (miRNA) are post-transcriptional regulators of cell proliferation, tissue differentiation, embryonic development, and apoptosis. Specific miRNA expression profiles may be characteristic of diseases or disease states and used as biomarkers. The identification of miRNA profiles has become important for streamlining drug development processes. The comparison of miRNA patterns from normal and disease samples; or contrasting miRNA profiles of the same sample in the presence or absence of a drug leads to a greater understanding of pathways and mechanisms of action. The WaferGen SmartChip System in conjunction with the pre-validated SmartChip human miRNA panel, offers researchers the ability to carry out comprehensive, rapid miRNA profiling on their human samples simply, cost-effectively, and accurately. The 96.96 Dynamic Arrays are at the heart of Fluidigm’s BioMark™ Genetic Analysis System, which delivers new efficiencies in Gene Expression and Genotyping. Fluidigm products enable and accelerate your Single Cell Gene Expression, Copy Number Variation and Absolute Quantitation research in completely new ways. Perform up to 200 PCR Arrays!